When breaking up old or unused concrete, the best ways to remove it depend on the size of the concrete you are removing. While chipping away concrete can involve intense labor, knowing the right tools to use for each project can make it relatively quick and easy. For large commercial jobs, it is best to seek advice or help from contractors specializing in the concrete field. Use a jackhammer to chip away concrete. When chipping away concrete that has a thickness of up to 2 inches, consider using a sledgehammer, handheld chipper hammer or an electric rotary hammer with a chipping hammer bit. Some examples of items with a 2-inch or less thickness include cultured stones for houses and fireplaces, small air conditioning pads, steppingstones and countertops. Chip the concrete into small pieces and place into buckets to dispose. Check your phone book under "concrete recycling" or take the concrete chunks to a city dump. Things like small houses, patios and small storage sheds will have concrete approximately 2 to 4 inches thick. Use electric jackhammers and electric rotary hammers to chip it away. 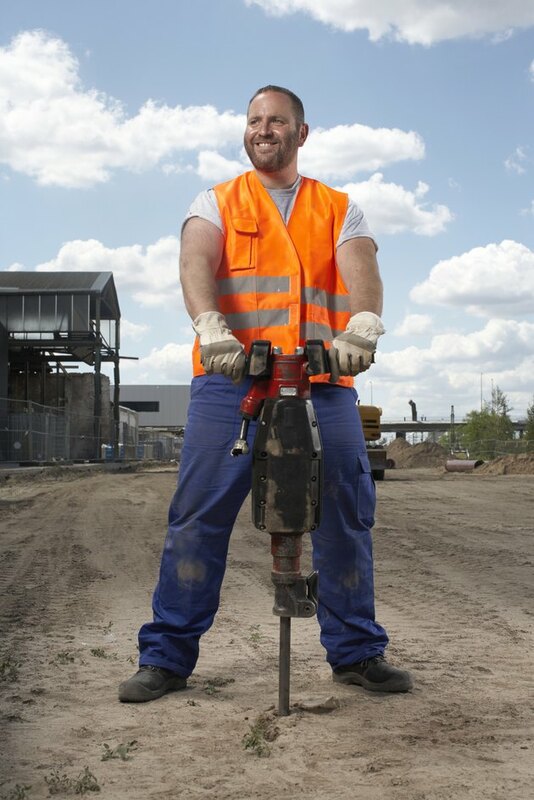 Jackhammers are powerful pounding tools with various chisel-like tips to break up concrete. To pound 2- to 4-inch walls, you can use a demolition hammer. Some demolition hammers can be lifted, which also allows them to chip away any elevated concrete surfaces. Jackhammers, electric rotary hammers and demolition hammers are available to rent at most home improvement stores. Most retail shops, commercial buildings, driveways, curbs and large houses have 4- to 6-inch thick concrete pads. This type of concrete thickness will take machines, such as small skid steers with chipping hammer attachments and air compressed jackhammers, to bust away the concrete. Another idea is to use a concrete saw cutting machine to cut the concrete into smaller chunks before chipping it into even smaller pieces. Load the smaller chunks of concrete onto trailers or large trucks to haul off to a concrete recycling company. Any concrete pads with 6-inch thickness or more will need special equipment to chip away the concrete to smaller pieces for hauling. Jobs of this size need large excavating machines with hydraulic hammer attachments and wrecking balls. Concrete with greater thickness than 6 inches includes highways, concrete columns, bridges and streets. Only commercial contractors break down concrete thickness of this size.